Despite being a lot harder to not go shopping more often when the sun is shining brightly, I am trying my very best to keep spending to a minimum this season. I have a wardrobe bursting full of dresses I mostly only wear on the weekends (because I can't be bothered with them for work), floral patterns, jumpsuits and flowy trousers; one would say I don't really need any more stuff. Having said that (there is always a but isn't there? 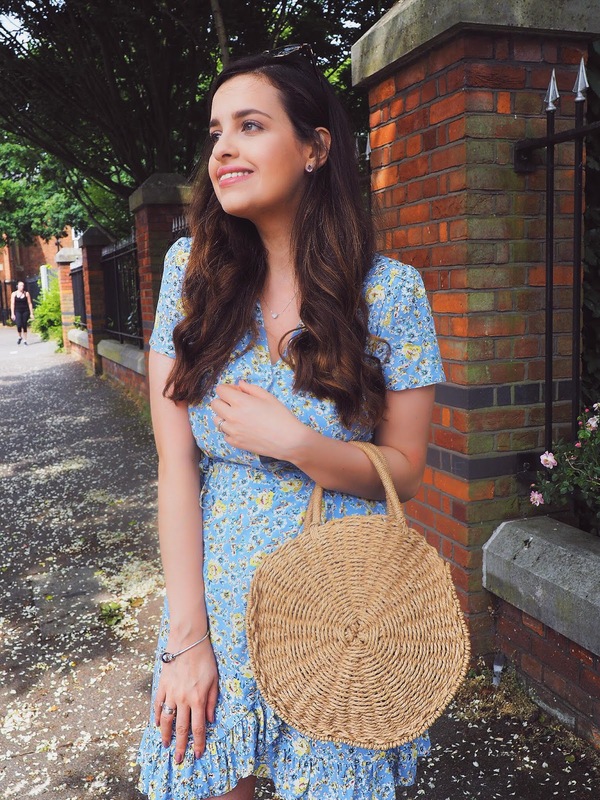 ), on a quick trip to Primark last weekend, I saw this dress which is pretty much the dress everyone has already picked and is wearing around social media and what can a girl do. 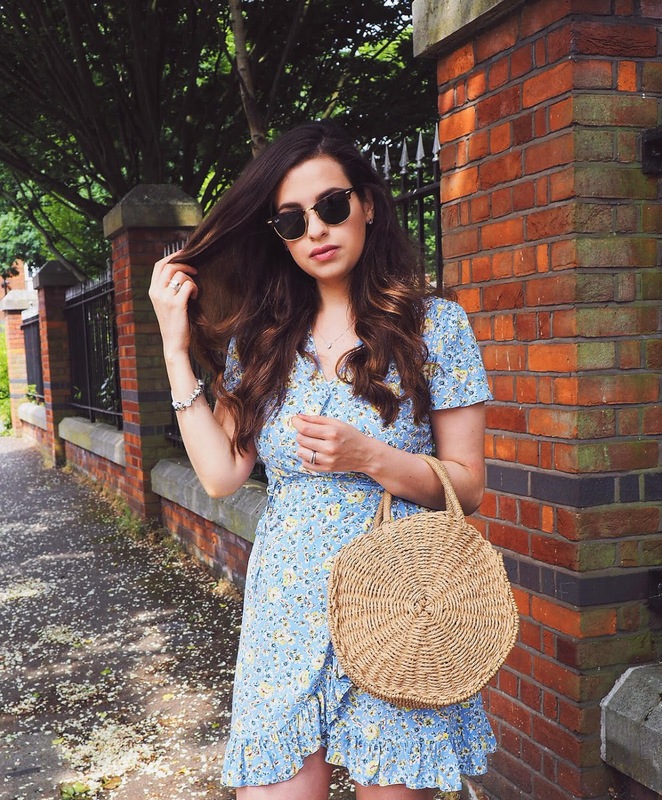 The £10 floral tea dress that not only looks amazingly cute but also a lot more expensive than it is (and not at all Primark like). If you read my tea dress post here, you will know I am obsessed with this style right now so I kinda justified this purchase for that sole reason. I'm happy to report though, I only picked up two other things whilst in there and for someone who would previously spend like there was no end, this is quite an achievement! Besides, it's only a cheek Primark haul which does no harm, right?! My favourite thing about this dress is how light it feels on. Albeit, probably not a dress to be wearing around town, considering the skirt isn't sewn together so you could potentially flash someone when the wind hits you (I did just that in the 5-minute walk to go shoot these photos), this is a dress I will definitely be taking on holiday with me. And with a tan, a massive sun hat and a bikini underneath, I bet this will look even better on. Now let's talk about this bag. If there is a trend bigger than straw bags this summer I don't know what it is. We're all obsessed and even though I had already featured one here, I wanted a bigger one to take with me to the beach. Little did I know, I wouldn't be to put this down and instead be wearing it around town repeatedly. This arrived last Saturday, and during the bank holiday weekend I wore this every single day, so expect to see it quite a bit on my upcoming Instagram photos (not following me yet? Check me out here!) because it's in pretty much all of them. I had seen similar offerings around for £30-£40 but I couldn't justify the price. Instead, off to eBay I went and despite coming from China and taking a week and a half to arrive I couldn't be more pleased! The bag is well made, super affordable (at exactly £12.68) and I can't wait to take it to Menorca with me (excuse me if I do continue to wear it non-stop until then). What are your summer favourites? Wearing anything on repeat? I wanna know, so do drop a comment below! I seriously need a straw bag in my life. yes you do haha :) especially for summer in SA, amazing! Thank you so much! have a great day too! Thank you Alice! Isn't it great! That dress looks like $100 and no way $10! What a steal and you look amazing in it. Love your cute dress and that straw bag. So trendy. Love this outfit. I am a bit wary of the wrap style because of the whole flashing issue. It makes me so self conscious so I haven't bought anymore than the one I have, but it is still such a pretty trend. And I am loving straw bags but still don't have one yet. Maybe I should pay ebay a visit haha. For £12, I think it's no brainer! off to eBay you go! Thank you Melissa! Yes, loving yellow, a bit of stripe here and there and definitely LOTS of floral prints! You look such a darling in that cute dress dear. Your hair is pretty gorgeous too! Os teus looks são um máximo :D Adoro tudooo! What a great print on the dress and I really like the bag, perfect for summer! Pam, you look soo pretty! This is my first time visiting your blog and I love it! Love this dress. Welcome :) I hope you come back for more! I need that straw bag in my life! Have a fab June, lovely! Everyone may wear it but it still looks so different and cute on you Pam. Lovely print. I haven't been shopping much myself. Love the dress such a pretty colour! Nice post. i love these dresses. You looking so pretty. Really I love your style. You look great in that dress. Chic look. and inexpensive! WIN! haha thank you!